The prominent, wedge-shaped Cape York Peninsula, thrusts up towards New Guinea. It was the last region of Australia to be developed. This finger of land tapers northwards for 700km, its eastern high country being an extension of the rugged Great Dividing Range that bisects the state of Queensland. The Peninsula Development Road cuts through the foothills of the range, so to travellers leaving Cooktown it is not obvious that most of the peninsula is actually flat savannah and floodplain. These alluvial plains run for hundreds of kilometres along the Gulf coast and extend well inland to form a vast Carpentaria Basin. In the wet season this complex mosaic of isolated river channels, billabongs and levees, is quickly transformed into shimmering inland lakes and wetlands that can engulf half the peninsula. This is reason enough to limit 4WD exploration of Cape York to the June to September dry season. Remarkably, given the concentration of high country in the east, there is a huge flood basin extending from the town of Laura to Princess Charlotte Bay on the Coral Coast. 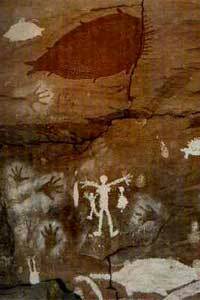 The basin is enclosed on three sides by massive sandstone hills, plateau's and abrupt escarpments where fine examples of ancient Aborigine rock art can be seen. Hundreds of swift streams flow westwards from the high country, cutting the main peninsula road. They then wander aimlessly across the plains to drain into the Gulf. As there are few bridges, this makes the journey to Cape York a challenge. By way of complete contrast, at the base of the peninsula around Chillagoe, there is a strikingly jagged landscape of ‘karst’ limestone towers and deep caves. The Mitchell River area is distinguished by bare granite and quartzite mountains, as well as limestone outcrops. 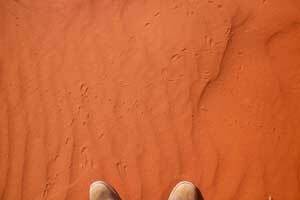 West of Laura is a plateau of red soil and sediments called ‘The Desert’. This region lacks surface water but still manages to support stands of tall trees. From here to Coen there is a sand-covered plateau that runs for 130km. With all this landscape variety compressed into one tropical peninsula, there is obviously huge scope for sightseeing and colour photography. Also for a whole host of holiday experiences - exploring sand hills, negotiating dusty bush tracks, catching barramundi, swimming in crystal-clear rock pools and picnicking in shady grottos beside murmuring streams. Enough landscapes indeed for an unforgettable Cape York adventure.